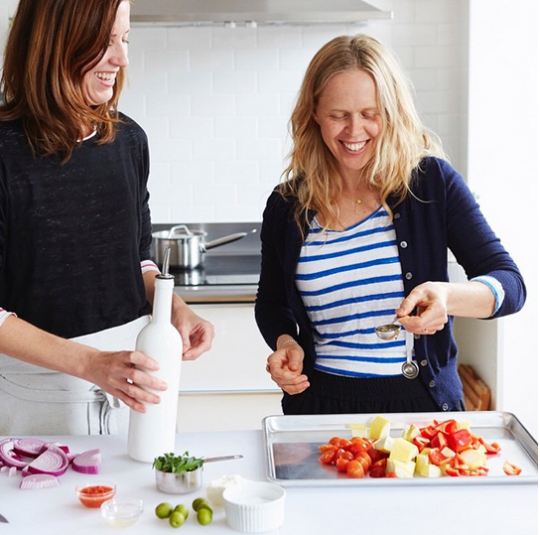 Whole food guru and James Beard Award winning author of At Home in The Whole Foods Kitchen, Amy Chaplin has shared her incredible recipe with us. This recipe is packed full of flavor. First from the caramelized onions and sautéed kale and lastly from the goat cheese rounds marinated in garlic and fresh thyme. Most of the goat cheese gets mixed into the pasta to coat the strands, with a few reserved for garnishing the top. Whole wheat pasta has never tasted so good. Cook, relax, and enjoy! Marinate cheese Cut goat cheese into ½-inch rounds. Peel and roughly chop garlic and remove leaves from thyme sprigs. Place cheese in a bowl and sprinkle with whole peppercorns, chopped garlic, and thyme leaves. Pour over ¼ cup oil and let marinate at room temperature. Caramelize onions Halve and peel onion, then thinly slice crosswise. Heat 1 tablespoon oil and onion in a large skillet over medium heat. Sauté until onions wilt and begin to brown, about 10 minutes. Meanwhile, remove thick kale stems from their leaves and thinly slice both ¼-½ inch crosswise, keeping leaves and stems separate. Add kale stems Stir ½ teaspoon salt and sliced kale stems into onions. Continue cooking until onions caramelize and stems are tender, about 10 minutes. Meanwhile, bring a large pot of salted water to a boil. Cook pasta Add pasta to boiling water and cook until al dente, about 10 to 12 minutes. Reserve ½ cup of cooking water and drain pasta. Cook kale While pasta cooks, stir kale leaves into onions and sauté until tender, 8-10 minutes. Toss together In a large bowl, toss pasta, onion-kale mixture, 2/3 of the marinated goat cheese and oil, and lots of freshly ground black pepper together. Drizzle in some of the reserved cooking water, if necessary, until the sauce is creamy and coats the pasta. Divide pasta among bowls, top with remaining goat cheese and serve immediately. Enjoy!